Colour has the power to inspire all of us. Over the last few years, we’ve been making the most of this power to create better living environments by helping to transform places and spaces in towns and cities all over the world, using little more than a few splashes of paint. 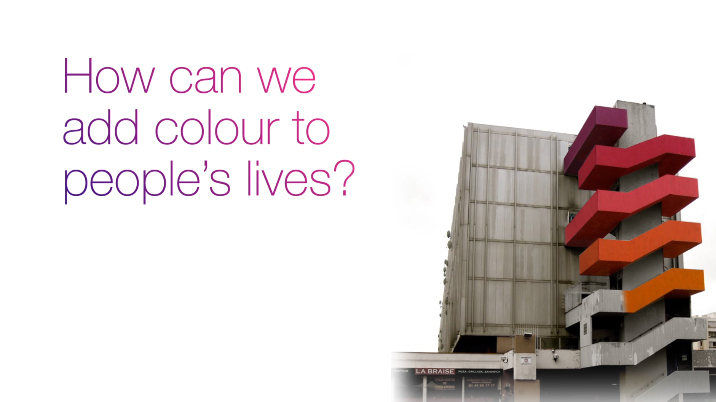 Designed to add colour to people’s lives, our Let’s Colour campaign has been a huge success, engaging local communities and encouraging residents to revitalize their surroundings. It’s also helping to create employment opportunities for people and build awareness among professionals about the positive effects and benefits of using colour. Originally introduced in Brazil, the ongoing worldwide initiative has brought a new lease of life to streets, houses, schools and squares in countries such as India, Canada, France, China, South Africa, Taiwan and Turkey. By donating more than 250,000 liters of paint and training hundreds of people, we’ve already inspired many thousands around the world. Our own employees have also volunteered thousands of hours to make the campaign a success. As well as making a positive social impact and reinforcing our role as the global colour authority, Let’s Colour is also encouraging consumers to use our brands and make their world a brighter and better place. In 2011, projects included a major event to repaint the town of Fortaleza in Brazil, which involved more than 200 volunteers and AkzoNobel employees. In Belgium, the historic water tower in Charleroi was given a much-needed makeover, while AkzoNobel employees also helped to give a fresh coat of paint to more than 100 houses in the north of Jutland in Denmark.